"There were nearly 80,000 new cases of bladder cancer and more than 18,000 deaths in 2017," said George Netto, M.D., a senior author on the UroSEEK paper, formerly at The Johns Hopkins University and currently chair of pathology at the University of Alabama-Birmingham. "This is about using the urine to detect the cancer. UroSEEK is a method of detection that many people have tried to find that is noninvasive." 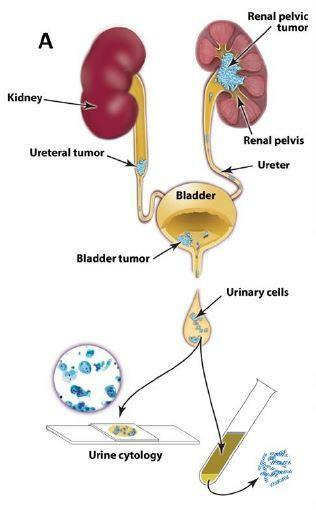 "In almost one-third of patients, bladder cancer detection is late. The cancer has already gotten into the surrounding muscle," Netto said. "Even in those detected at an earlier stage, the tumors frequently recur. Patients are committed to a lifelong surveillance that requires invasive cystoscopy procedures and biopsies and is costly." "When you combine them, you get better results," said Nickolas Papadopoulos, Ph.D., a senior author and an investigator at the Ludwig Center at Johns Hopkins. "Side by side, UroSEEK has better sensitivity. There are some cases when cytology detects when UroSEEK doesn't. Combining them produces the best results." The research was supported by Henry and Marsha Laufer, Arthur P Grollman, Ludwig Institute for Cancer Research (LICR), Conrad N. Hilton Foundation (CNHF), Sol Goldman Pancreatic Research Foundation, HHS | National Institutes of Health (NIH), John Templeton Foundation and the National Science Council 104-2314-B-002-132,104-2314-B-002-121-MY3. COI: Papadopoulos is the founder of Personal Genome Diagnostics and PapGene and advises Sysmex-Inostics. These companies and others have licensed technologies from Johns Hopkins, of which Vogelstein, Kinzler and Papadopoulos are inventors on a patent (U.S. 20140227705 A1) and receive royalties. The terms of these arrangements are managed by the university in accordance with its conflict of interest policies. Kinzler is the founder of Personal Genome Diagnostics and PapGene and advises Sysmex-Inostics. These companies and others have licensed technologies from Johns Hopkins, of which Vogelstein, Kinzler and Papadopoulos are inventors on a patent (U.S. 20140227705 A1) and receive royalties. The terms of these arrangements are managed by the university in accordance with its conflict of interest policies. Vogelstein is the founder of Personal Genome Diagnostics and PapGene and advises Sysmex-Inostics. These companies and others have licensed technologies from Johns Hopkins, of which Vogelstein, Kinzler and Papadopoulos are inventors on a patent (U.S. 20140227705 A1) and receive royalties. The terms of these arrangements are managed by the university in accordance with its conflict of interest policies.